Bolstering its commitment to a safe and respectful community, the College has recently revamped its sexual assault and harassment policies and procedures. Completely revamping policies and procedures regarding sexual harassment and sexual assault while revising and/or enhancing prevention and education programming for the community. Creating a cohesive and comprehensive training program for the entire campus community including conducting more than 50 training sessions on Title IX and Clery Act compliance, in addition to dozens of information sessions. More are planned for the future. Forming a Clery Act Compliance Committee of students, faculty, and staff; designating a full-time interim Title IX coordinator and four Title IX deputies; conducting a search for a permanent Title IX coordinator; and adding new staff members to support the Swarthmore community. Released in late January, the report affirms the College’s ongoing dedication to streamlining and improving policies and practices. Central to these efforts is the focus on prevention and education. A task force on campus culture, whose members include Managers, faculty, students, and staff, will issue its report this spring. 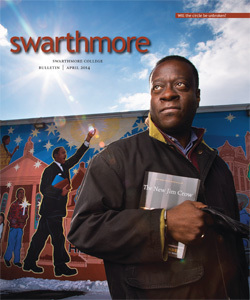 That commitment extends beyond campus, with Swarthmore’s actions coming at a time when public and private officials across the United States, including at many colleges and universities, are reconsidering best practices for ensuring the safety of their communities. To read the final report and its executive summary, click here. President Chopp’s accompanying letter to the community may be read here. That it took two Federal complaints and a Justice Department investigation to get Swarthmore to address its longstanding non-compliance and denial around sexual assault on campus speaks volumes about the hypocrisy that can thrive in even the most noble of institutions. In November 2009, shortly after becoming Swarthmore's 14th President, Rebecca Chopp came to Boston on a "Listening Tour". I spoke with her at that event, and alerted her to Swarthmore's egregious and illegal behavior when (prior to her arrival) several Swarthmore students were assaulted by a classmate in the fall of 2007 (Phoenix 1/31/08). I told her specifically that Clery reporting requirements were blatantly violated, and that, in my opinion, the College was putting its students and its reputation at serious risk. I urged her to take prompt steps to reform deficient procedures and, if nothing else, start complying with the law. Apparently this advice fell on deaf ears. Kudos to the courage and determination of Mia Ferguson '15 and Hope Brinn 15 for holding cowardly administrators to at least the minimum legal standard. This should not have taken more than three years and a lawsuit. All members of the Swarthmore community might ask themselves why it did.